Are you looking for information on the company Visbjerggaarden AS located in Denmark who sells Onion Yellow? If so, read below to read one buyer’s experience with this company. 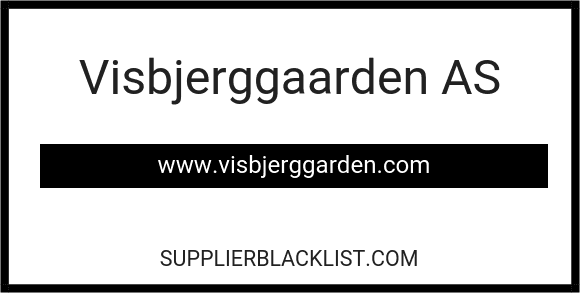 Also you will find related search links to explore more about Visbjerggaarden AS on Supplier Blacklist and across the web. We were looking for onion. I sent several inquiries through Alibaba.com and I left general inquiry there. I was contacted by mentioned company. They wrote that they received my inquiry and that they can offer Onion. The sent us price offer for 8000 kg of onion. My superiors decided to order. We confirmed general terms. Price was DAP and payment terms was prepayment. We sent the order. We received proforma invoice. We paid and send confirmation. Few days later we received an email. We were informed, that they can’t send 8000 kg but only 24 000 kg and want us to send next payment. We refused and we wanted to received paid money back. ”Supplier” informed us that they spent the money to prepare delivery of the goods and they cant send back. We asked one friend who can speak Danish to call there. We find out that nobody from the company can speak Danish and they hardly can speak English. Be very careful to contact this company. Need More Info on Visbjerggaarden AS? If you need more information, you can click the below links to search for more submissions about Visbjerggaarden AS on Supplier Blacklist as well as go to the search results page on Google for more reviews online about this company. Perform a Supplier Blacklist search for more reviews on Visbjerggaarden AS. Search Google for Visbjerggaarden AS Reviews.